This article is about the medieval Muslim scientist and scholar. For the lunar crater, see Al-Biruni (crater). For the university, see Al-Beroni University. Abū Rayḥān Muḥammad ibn Aḥmad Al-Bīrūnī (Chorasmian/Persian: ابوریحان محمد بن احمد البیرونی‎ Abū Rayḥān Bērōnī; New Persian: Abū Rayḥān Bīrūnī) (973–1050), known as Al-Biruni (Arabic: البيروني‎) in English, was an Iranian scholar and polymath. He was from Khwarazm – a region which encompasses modern-day western Uzbekistan, and northern Turkmenistan. Biruni is regarded as one of the greatest scholars of the medieval Islamic era and was well versed in physics, mathematics, astronomy, and natural sciences, and also distinguished himself as a historian, chronologist and linguist. He studied almost all fields of science and was compensated for his research and strenuous work. Royalty and powerful members of society sought out Al-Biruni to conduct research and study to uncover certain findings. He lived during the Islamic Golden Age, in which scholarly thought went hand in hand with the thinking and methodology of the Islamic religion. In addition to this type of influence, Al-Biruni was also influenced by other nations, such as the Greeks, who he took inspiration from when he turned to studies of philosophy. He was conversant in Khwarezmian, Persian, Arabic, Sanskrit, and also knew Greek, Hebrew and Syriac. He spent much of his life in Ghazni, then capital of the Ghaznavid dynasty, in modern-day central-eastern Afghanistan. In 1017 he travelled to South Asia and authored a study of Indian culture (Tahqiq ma li-l-hind...) after exploring the Hinduism practised in India. [a] He was given the title "founder of Indology". He was an impartial writer on customs and creeds of various nations, and was given the title al-Ustadh ("The Master") for his remarkable description of early 11th-century India. He was born in the outer district of Kath, the capital of the Afrighid dynasty of Khwarezm (now a part of Uzbekistan, Kazakhstan, and Turkmenistan) (or Chorasmia). To conduct research, Al-Biruni used different methods to tackle the various fields he studied. Many consider Al-Biruni one of the greatest scientists in history, and especially of Islam because of his discoveries and methodology. He lived during the Islamic Golden Age, which promoted astronomy and encouraged all scholars to work on their research. Al-Biruni spent the first twenty-five years of his life in Khwarezm where he studied Islamic jurisprudence, theology, grammar, mathematics, astronomy, medicine, philosophy and also dabbled in the field of physics and most other sciences as well. The Iranian Khwarezmian language, which was the language of Biruni, survived for several centuries after Islam until the Turkification of the region, and so must some at least of the culture and lore of ancient Khwarezm, for it is hard to see the commanding figure of Biruni, a repository of so much knowledge, appearing in a cultural vacuum. He was sympathetic to the Afrighids, who were overthrown by the rival dynasty of Ma'munids in 995. He left his homeland for Bukhara, then under the Samanid ruler Mansur II the son of Nuh. There he corresponded with Avicenna and there are extant exchanges of views between these two scholars. In 998, he went to the court of the Ziyarid amir of Tabaristan, Shams al-Mo'ali Abol-hasan Ghaboos ibn Wushmgir. There he wrote his first important work, al-Athar al-Baqqiya 'an al-Qorun al-Khaliyya (literally: "The remaining traces of past centuries" and translated as "Chronology of ancient nations" or "Vestiges of the Past") on historical and scientific chronology, probably around 1000 A.D., though he later made some amendments to the book. He also visited the court of the Bavandid ruler Al-Marzuban. Accepting the definite demise of the Afrighids at the hands of the Ma'munids, he made peace with the latter who then ruled Khwarezm. Their court at Gorganj (also in Khwarezm) was gaining fame for its gathering of brilliant scientists. Ninety-five of 146 books known to have been written by Bīrūnī were devoted to astronomy, mathematics, and related subjects like mathematical geography. His religion contributed to his research of astronomy, as in Islam, worship and prayer require knowing the precise directions of sacred locations, which can only be accurately found using astronomical data. Biruni's major work on astrology is primarily an astronomical and mathematical text, only the last chapter concerns astrological prognostication. His endorsement of astrology is limited, in so far as he condemns horary astrology as 'sorcery'. [T]he rotation of the earth does in no way impair the value of astronomy, as all appearances of an astronomic character can quite as well be explained according to this theory as to the other. There are, however, other reasons which make it impossible. This question is most difficult to solve. The most prominent of both modern and ancient astronomers have deeply studied the question of the moving of the earth, and tried to refute it. We, too, have composed a book on the subject called Miftah-ilm-alhai'a (Key to Astronomy), in which we think we have surpassed our predecessors, if not in the words, at all events in the matter. In his description of Sijzi's astrolabe he hints at contemporary debates over the movement of the earth. He carried on a lengthy correspondence and sometimes heated debate with Ibn Sina, in which Biruni repeatedly attacks Aristotle's celestial physics: he argues by simple experiment that vacuum must exist; he is "amazed" by the weakness of Aristotle's argument against elliptical orbits on the basis that they would create vacuum; he attacks the immutability of the celestial spheres; and so on. In his major extant astronomical work, the Mas'ud Canon, Biruni utilizes his observational data to disprove Ptolemy's immobile solar apogee. Not only did he perform research on theories, but he also wrote an in-depth analysis and explanation of an astrolabe and how it should work. He drew many different depictions of various instruments that are considered to be the precursors of more modern objects such as clocks and the astrolabe, in which other scientists were able to use to complete these inventions in the coming years. More recently, Biruni's eclipse data was used by Dunthorne in 1749 to help determine the acceleration of the moon, and his observational data has entered the larger astronomical historical record and is still used today in geophysics and astronomy. "Al-Biruni contributed to the introduction of the experimental scientific method to mechanics, unified statics and dynamics into the science of mechanics, and combined the fields of hydrostatics with dynamics to create hydrodynamics. He came up with different methods for exploring densities, weight, and even gravity. Along with those methods, Biruni went so far as to describe instruments that go along with each of those areas as well. Although he never entirely focuses just on physics in any of his books, the study of physics is present throughout many of his various works. Biruni also came up with different hypotheses about heat and light. Bīrūnī devised a method of determining the earth's radius by means of the observation of the height of a mountain. He carried it out at Nandana in Pind Dadan Khan in Pakistan. He was heavily interested in the workings of the earth and included research about the planet in many of his works. The result of his discovery of radius measurement was due to Biruni's arduous research about the earth. In his Codex Masudicus (1037), Al-Biruni theorized the existence of a landmass along the vast ocean between Asia and Europe, or what is today known as the Americas. He deduced its existence on the basis of his accurate estimations of the Earth's circumference and Afro-Eurasia's size, which he found spanned only two-fifths of the Earth's circumference, and his discovery of the concept of specific gravity, from which he deduced that the geological processes that gave rise to Eurasia must've also given rise to lands in the vast ocean between Asia and Europe. He also theorized that the landmass must be inhabited by human beings, which he deduced from his knowledge of humans inhabiting the broad north-south band stretching from Russia to South India and Sub-Saharan Africa, theorizing that the landmass would most likely lie along the same band. Biruni's most important work was a major pharmacopoeia, the "Kitab al-saydala fi al-tibb" (Book on the Pharmacopoeia of Medicine), describing essentially all the medicines known in his time. It lists synonyms for drug names in Syriac, Persian, Greek, Baluchi, Afghan, Kurdi, and some Indian languages. Due to an apparatus he constructed himself, he succeeded in determining the specific gravity of a certain number of metals and minerals with remarkable precision. Biruni's main essay on political history, Kitāb al-musāmara fī aḵbār Ḵᵛārazm (Book of nightly conversation concerning the affairs of Ḵᵛārazm) is now known only from quotations in Bayhaqī's Tārīkh-e masʿūdī. In addition to this various discussions of historical events and methodology are found in connection with the lists of kings in his al-Āthār al-bāqiya and in the Qānūn as well as elsewhere in the Āthār, in India, and scattered throughout his other works. Al-Biruni's study of history was not limited to the aforementioned topics, he also touched upon the topic of the earth's creation. He elaborated upon the fact that the earth was created from the elements and not solely through divine creation. Even though Islam did influence his study, he did acknowledge the role of the elements. Bīrūnī is one of the most important Muslim authorities on the history of religion. Al-Biruni was a pioneer in the study of comparative religion. He studied Zoroastrianism, Judaism, Hinduism, Christianity, Buddhism, Islam, and other religions. He treated religions objectively, striving to understand them on their own terms rather than trying to prove them wrong. His underlying concept was that all cultures are at least distant relatives of all other cultures because they are all human constructs. "What al-Biruni seems to be arguing is that there is a common human element in every culture that makes all cultures distant relatives, however foreign they might seem to one another." Al-Biruni divides Hindus into an educated and an uneducated class. He describes the educated as monotheistic, believing that God is one, eternal, and omnipotent and eschewing all forms of idol worship. He recognizes that uneducated Hindus worshipped a multiplicity of idols yet points out that even some Muslims (such as the Jabiriyya) have adopted anthropomorphic concepts of God. Al-Biruni wrote about the peoples, customs and religions of the Indian subcontinent. According to Akbar S. Ahmed, like modern anthropologists, he engaged in extensive participant observation with a given group of people, learnt their language and studied their primary texts, presenting his findings with objectivity and neutrality using cross-cultural comparisons. Akhbar S. Ahmed concluded that Al-Biruni can be considered as the first Anthropologist, however, others argue that he hardly can be considered an anthropologist in the conventional sense. Bīrūnī's fame as an Indologist rests primarily on two texts. Al-Biruni wrote an encyclopedic work on India called Taḥqīq mā li-l-hind min maqūlah maqbūlah fī al-ʿaql aw mardhūlah (variously translated as "Verifying All That the Indians Recount, the Reasonable and the Unreasonable" or "The book confirming what pertains to India, whether rational or despicable") in which he explored nearly every aspect of Indian life, including religion, history, geography, geology, science, and mathematics. During his journey through India, military and political histories were not of Al-Biruni's main focus. Instead, he decided to document the more civilian and scholarly areas of Hindu life such as culture, science, and religion. He explores religion within a rich cultural context. He expresses his objective with simple eloquence: He also translated the works of Indian sage Patanjali with the title Tarjamat ketāb Bātanjalī fi’l-ḵalāṣ men al-ertebāk. An example of Al-Biruni's analysis is his summary of why many Hindus hate Muslims. Biruni notes in the beginning of his book how the Muslims had a hard time learning about Hindu knowledge and culture. He explains that Hinduism and Islam are totally different from each other. Moreover, Hindus in 11th century India had suffered waves of destructive attacks on many of its cities, and Islamic armies had taken numerous Hindu slaves to Persia, which—claimed Al-Biruni—contributed to Hindus becoming suspicious of all foreigners, not just Muslims. Hindus considered Muslims violent and impure, and did not want to share anything with them. Over time, Al-Biruni won the welcome of Hindu scholars. Al-Biruni collected books and studied with these Hindu scholars to become fluent in Sanskrit, discover and translate into Arabic the mathematics, science, medicine, astronomy and other fields of arts as practiced in 11th-century India. He was inspired by the arguments offered by Indian scholars who believed earth must be globular in shape, which is the only way to fully explain the difference in daylight hours by latitude, seasons and earth's relative positions with moon and stars. At the same time, Al-Biruni was also critical of Indian scribes who he believed carelessly corrupted Indian documents while making copies of older documents. He also criticized the Hindus on what he saw them do and not do, like their deficiencies in curiosity about history and religion. One of the specific aspects of Hindu life that Al-Biruni studied was the Hindu calendar. His scholarship on the topic exhibited great determination and focus, not to mention the excellence in his approach of the in-depth research he performed. He developed a method for converting the dates of the Hindu calendar to the dates of the three different calendars that were common in the Islamic countries of his time period, the Greek, the Arab/Muslim, and the Persian. Biruni also employed astronomy in the determination of his theories, which were complex mathematical equations and scientific calculation that allows one to convert dates and years between the different calendars. The book does not limit itself to tedious records of battle because Al-Biruni found the social culture to be more important. The work includes research on a vast array of topics of Indian culture, including descriptions of their traditions and customs. Although he tried to stay away from political and military history, Biruni did indeed record important dates and noted actual sites of where significant battles occurred. Additionally, he chronicled stories of Indian rulers and told of how they ruled over their people with their beneficial actions and acted in the interests of the nation. But, his details are brief and mostly just list rulers without referring to their real names. He did not go on about deeds that each one carried out during their reign, which keeps in line with Al-Biruni's mission to try to stay away from political histories. Al-Biruni also described the geography of India in his work. He documented different bodies of water and other natural phenomena. These descriptions are useful to today's modern historians because they are able to use Biruni's scholarship to locate certain destinations in modern-day India. Historians are able to make some matches while also concluding that certain areas seem to have disappeared and been replaced with different cities. Different forts and landmarks were able to be located, legitimizing Al-Biruni's contributions with their usefulness to even modern history and archeology. The dispassionate account of Hinduism given by Al-Biruni was remarkable for its time. He stated that he was fully objective in his writings, remaining unbiased like a proper historian should. Biruni documented everything about India just as it happened. But, he did note how some of the accounts of information that he was given by natives of the land may not have been reliable in terms of complete accuracy, however, he did try to be as honest as possible in his writing. Mohammad Yasin compares it to "a magic island of quiet, impartial research in the midst of a world of clashing swords, burning towns, and plundered temples." Biruni's writing was very poetic, which may diminish some of the historical value of the work for modern times. The lack of description of battle and politics makes those parts of the picture completely lost. However, Many have used Al-Biruni's work to check facts of history in other works that may have been ambiguous or had their validity questioned. Most of the works of Al-Biruni are in Arabic although he wrote one of his masterpieces, the Kitab al-Tafhim apparently in both Persian and Arabic, showing his mastery over both languages. Bīrūnī's catalogue of his own literary production up to his 65th lunar/63rd solar year (the end of 427/1036) lists 103 titles divided into 12 categories: astronomy, mathematical geography, mathematics, astrological aspects and transits, astronomical instruments, chronology, comets, an untitled category, astrology, anecdotes, religion, and books he no longer possesses. A Critical Study of What India Says, Whether Accepted by Reason or Refused (تحقيق ما للهند من مقولة معقولة في العقل أو مرذولة); or Indica; or Kitab al-Hind; Kitab al-Bīrūnī fī Taḥqīq mā li-al-Hind. ; or Alberuni's India (Translation) – compendium of India's religion and philosophy. The Remaining Signs of Past Centuries (الآثار الباقية عن القرون الخالية) – a comparative study of calendars of cultures and civilizations, (including several chapters on Christian cults) with mathematical, astronomical, and historical information. Melkite Calendar, or Les Fetes des Melchites – Arabic text with French translation extract from The Remaining Signs of Past Centuries. The Mas'udi Canon (قانون مسعودي) – encyclopedia of astronomy, geography, and engineering, dedicated to Mas'ud, son of Mahmud of Ghazni of the eponymous title. Understanding Astrology (التفهيم لصناعة التنجيم) – a question and answer style book about mathematics and astronomy, in Arabic and Persian. Pharmacy – on drugs and medicines. Gems (الجماهر في معرفة الجواهر) – geology manual of minerals and gems. Dedicated to Mawdud son of Mas'ud. Kitab al-Āthār al-Bāqīyah ‘an al-Qurūn al-Khālīyah. 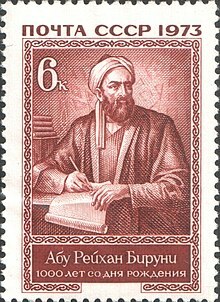 Biruni wrote most of his works in Arabic, as the scientific language of his age, however, his Persian version of the Al-Tafhim is one of the most important of the early works of science in the Persian language, and is a rich source for Persian prose and lexicography. The book covers the Quadrivium in a detailed and skilled fashion. After Al-Biruni's death, in the Ghaznavid dynasty and following centuries his work was not built on, nor referenced. It was only hundreds of years later in the West, that his books became read and referenced again, especially his book on India which became relevant to the British Empire's activity in India from the 17th century. A film about his life, Abu Raykhan Beruni, was released in the Soviet Union in 1974. The lunar crater Al-Biruni and the asteroid 9936 Al-Biruni were named in his honour. In June 2009, Iran donated a pavilion to the United Nations Office in Vienna—placed in the central Memorial Plaza of the Vienna International Center. Named the Scholars Pavilion, it features the statues of four prominent Iranian scholars: Avicenna, Abu Rayhan Biruni, Zakariya Razi (Rhazes) and Omar Khayyam. ^ Al-Biruni's idea of al-Hind (India) was a cultural zone, more or less coinciding with the present day India. ^ Patrologia orientalis. Robarts – University of Toronto. Paris Firmin-Didot. 1907. p. 291. ^ a b Kennedy, E.S. (1975-06-26). "The Exact Sciences". In Frye, R. N.; Fisher, William Bayne. The Cambridge History of Iran: The period from the Arab invasion to the Saljuqs. Cambridge University Press. p. 394. ISBN 9780521200936. ^ Ataman, Kemal (2008). Understanding Other Religions: Al-Biruni's and Gadamer's "fusion of Horizons". CRVP. p. 58. ISBN 9781565182523. ^ Bīrūnī, Muḥammad ibn Aḥmad (1879). The Chronology of Ancient Nations: An English Version of the Arabic Text of the Athâr-ul-Bâkiya of Albîrûnî, Or "Vestiges of the Past". Translated by Sachau, Eduard. Oriental translation fund of Great Britain & Ireland. In our time the word is pronounced Biruni (or Beerooni), e.g. in Teheran. but the vowel of the first syllable is majhul, which means that in more ancient times it was pronounced Beron (or Bayroon)... That the name was pronounced in this way in Central Asia about the author's time, we learn from indisputable statement regarding our author from the pen of Alsam'ani, a philologist and biographer of high repute. ^ Mackenzie, D.N. (2014-09-25). A Concise Pahlavi Dictionary. Routledge. ISBN 978-1-1366-1396-8. ^ BĪRŪNĪ, ABŪ RAYḤĀN. Encyclopædia Iranica, (1989, December 15). Retrieved August 20, 2015. Rahman, H. U. (1995), A Chronology of Islamic History : 570 – 1000 CE, London: Mansell Publishing, p. 167, ISBN 1-897940-32-7, A Persian by birth, Biruni produced his writings in Arabic, though he knew, besides Persian, no less than four other languages. "Al-Bīrūnī | Persian scholar and scientist". Encyclopedia Britannica. Retrieved 2018-07-06. Lindberg, David C. (1980-03-15). Science in the Middle Ages. University of Chicago Press. p. 18. ISBN 9780226482330. A Persian by birth, a rationalist in disposition, this contemporary of Avicenna and Alhazen not only studied history, philosophy, and geography in depth, but wrote one of the most comprehensive Muslim astronomical treatises, the Qanun Al-Masu'di. Massignon, L. (1951). "Al-Biruni et la valuer internationale de la science arabe"". Al-Bīrūnī Commemoration Volume A.H.362-A.H.1362. Iran Society. pp. 217–219. In a celebrated preface to the book of Drugs, Biruni says, "And if it is true that in all nations one likes to adorn oneself by using the language to which one has remained loyal, having become accustomed to using it with friends and companions according to need, I must judge for myself that in my native Khwarezmian, science has as much as chance of becoming perpetuated as a camel has of facing Kaaba. ^ Healey, Christina (2006). Al-Biruni. ^ Verdon, Noémie (2015). "Conceptualisation of al-Hind by Arabic and Persian writers". In Ray, Himanshu Prabha. Negotiating Cultural Identity: Landscapes in Early Medieval South Asian History. Routledge. p. 52. ISBN 978-1-317-34130-7. ^ a b c d e f g h i j Sparavigna, Amelia (2013). "The Science of Al-Biruni". International Journal of Sciences. 2. ^ Strohmaier 2006, p. 112. ^ Papan-Matin, Firoozeh (2010). Beyond Death: The Mystical Teachings of ʻAyn Al-Quḍāt Al-Hamadhānī. BRILL. p. 111. ISBN 9004174133. ^ Hodgson, Marshall G. S. (1974). The Venture of Islam: Conscience and History in a World Civilization. University of Chicago Press. p. 68. ISBN 978-0226346779. ^ Waardenburg, Jacques (1999-08-19). Muslim Perceptions of Other Religions: A Historical Survey. Oxford University Press. p. 27. ISBN 9780195355765. ^ Khan, M.S. (1976). "Al-Biruni and the Political History of India". Oriens. 25/26. ^ Al-Biruni, R. (2004-03-01). The Book of Instruction in the Elements of the Art of Astrology. Kessinger Publishing. ISBN 9780766193079. ^ Noonan, George C. (July 2005). Classical Scientific Astrology. American Federation of Astr. ISBN 9780866900492. ^ Berjak 2005, part 5. ^ Berjak 2005, part 3. ^ Berjak 2005, part 8. ^ Rosenfeld, B. "Book review of Life and Works of al-Buruni by P. Bulgakov". Journal for the History of Astronomy. 5: 135. Retrieved 2018-07-06. ^ Covington, Richard. "Rediscovering Arabic Science". Aramco World. Retrieved 2018-10-05. ^ Houtsma M. Th. in Encyclopaedia of Islam (Bearman, P.; Bianquis, Th. ; Bosworth, C.E. ; van Donzel, E.; Heinrichs, W.P., eds. ), (2007). ^ Stephenson, F. Richard (2008-03-24). Historical Eclipses and Earth's Rotation. Cambridge University Press. pp. 45, 457, 488–499. ISBN 9780521056335. ^ a b Alikuzai 2013. ^ Rozhanskaya, Mariam; Levinova, I. S. (1996). Rushdī, Rāshid, ed. Statics. Encyclopedia of the History of Arabic Science. Psychology Press. p. 642. ISBN 9780415124119. Using a whole body of mathematical methods (not only those inherited from the antique theory of ratios and infinitesimal techniques, but also the methods of the contemporary algebra and fine calculation techniques), Muslim scientists raised statics to a new, higher level. The classical results of Archimedes in the theory of the centre of gravity were generalized and applied to three-dimensional bodies, the theory of ponderable lever was founded and the 'science of gravity' was created and later further developed in medieval Europe. The phenomena of statics were studied by using the dynamic approach so that two trends – statics and dynamics – turned out to be inter-related within a single science, mechanics. The combination of the dynamic approach with Archimedean hydrostatics gave birth to a direction in science which may be called medieval hydrodynamics. [...] Numerous fine experimental methods were developed for determining the specific weight, which were based, in particular, on the theory of balances and weighing. The classical works of al-Biruni and al-Khazini can by right be considered as the beginning of the application of experimental methods in medieval science. ^ Starr, S. Frederick (12 December 2013). "So, Who Did Discover America? | History Today". www.historytoday.com. Retrieved 2018-07-06. ^ Kujundzić, E.; Masić, I. (1999). "[Al-Biruni—a universal scientist]". Med. Arh. (in Croatian). 53 (2): 117–120. PMID 10386051. ^ Levey, Martin (1973). Early Arabic Pharmacology: An Introduction Based on Ancient and Medieval Sources. Brill Archive. p. 179. ISBN 90-04-03796-9. ^ a b Pingree 2010. ^ Rosenthal 1976, p. 10. ^ Ahmed, Akbar S. (1984). "Al-Beruni: The First Anthropologist". RAIN (60): 9–10. doi:10.2307/3033407. JSTOR 3033407. ^ Tapper, Richard (1995). ""Islamic Anthropology" and the "Anthropology of Islam"". Anthropological Quarterly. 68 (3): 185–193. doi:10.2307/3318074. JSTOR 3318074. ^ a b Lawrence 1989. ^ George Saliba. "Al-Bīrūnī". Encyclopaedia Britannica. Retrieved Aug 12, 2017. ^ a b c d e f Khan, M.S. (1976). "Al-Biruni and the Political History of India". Oriens. 25/26. ^ Bīrūnī, Muḥammad ibn Aḥmad (1910). "On the Hindus in General, as an Introduction to Our Account of Them". Alberuni's India: An Account of the Religion, Philosophy, Literature, Geography, Chronology, Astronomy, Customs, Laws and Astrology of India about A.D. 1030. 1. London: Kegan Paul, Trench, Trübner. p. 17see also Vol 2 of Al-Biruni's India. ^ Kennedy, E.S. ; Engle, Susan; Wamstad, Jeanne (1965). "The Hindu Calendar as Described in Al-Biruni's Masudic Canon". Journal of Near Eastern Studies. 24. ^ Yasin, Mohammad (1988). Reading in Indian history. New Delhi, India: Atlantic Publishers & Distri. p. 19. ISBN 978-8-1715-6120-9. Retrieved 22 June 2016. ^ a b c d S.H. Nasr, "An introduction to Islamic cosmological doctrines: conceptions of nature and methods used for its study by the Ikhwān al-Ṣafāʾ, al-Bīrūnī, and Ibn Sīnā", 2nd edition, Revised. SUNY press, 1993. pp 111: "Al-Biruni wrote one of the masterpieces of medieval science, Kitab al-Tafhim, apparently in both Arabic and Persian, demonstrating how conversant he was in both tongues. The Kitab al-Tafhim is without doubt the most important of the early works of science in Persian and serves as a rich source for Persian prose and lexicography as well as for the knowledge of the Quadrivium whose subjects it covers in a masterly fashion"
^ "Kitāb al-tafhīm li-awā'īl ṣinā'at al-tanjīm كتاب التفهيم لأوائل صناعة التنجيم Bīrūnī, Muḥammad ibn Aḥmad بيروني، محمد بن أحمد". Qatar Digital Library. 2014-05-16. Retrieved 2018-11-20. ^ Patrologia orientalis. Robarts – University of Toronto. Paris Firmin-Didot. 1907 . pp. 291–312. ^ "BBc Radio: In our Time – Al-Biruni". ^ UNIS. "Monument to Be Inaugurated at the Vienna International Centre, 'Scholars Pavilion' donated to International Organizations in Vienna by Iran". Retrieved 11 September 2016. ^ "Permanent mission of the Islamic Republic of Iran to the United Nations office – Vienna". en.viennaun.mfa.ir. ^ Hosseini, Mir Masood. "Negareh: Persian Scholars Pavilion at United Nations Vienna, Austria". Retrieved 11 September 2016. Bearman, P.; Bianquis, Th. ; Bosworth, C.E. ; van Donzel, E.; Heinrichs, W.P., eds. (2007). Encyclopaedia of Islam. Retrieved 10 November 2007. MacKenzie, D. N. (October 18, 2011). "CHORASMIA iii. The Chorasmian Language". Encyclopaedia Iranica. Retrieved 2018-07-06. Chorasmian, the original Iranian language of Chorasmia, is attested at two stages of its development. The earliest examples have been left by the great Chorasmian scholar Abū Rayḥān Bīrūnī. Strohmaier, Gotthard (2006). "Biruni". In Meri, Josef W. Medieval Islamic Civilization: A-K, index. Taylor & Francis. ISBN 9780415966917. "Ibn Sina - Al-Biruni Correspondence" (PDF). Translated by Berjak, Rafik. 2005. Retrieved 15 January 2019. Alikuzai, Hamid Wahed (October 2013). A Concise History of Afghanistan in 25 Volumes. 1. Trafford Publishing. ISBN 9781490714462. Bosworth, C.E. (February 1, 2010). "BĪRŪNĪ, ABŪ RAYḤĀN i. Life". www.iranicaonline.org. Retrieved 2018-07-04. Pingree, David (February 1, 2010). "BĪRŪNĪ, ABŪ RAYḤĀN ii. Bibliography". www.iranicaonline.org. Retrieved 2018-07-04. Saliba, George (2010). "BĪRŪNĪ, ABŪ RAYḤĀN iii. Mathematics and Astronomy". www.iranicaonline.org. Retrieved 2018-07-04. Pingree, David (2010). "BĪRŪNĪ, ABŪ RAYḤĀN iv. Geography". www.iranicaonline.org. Retrieved 2018-07-04. Anawati, Georges C. (1989). "Pharmacology and Mineralogy". www.iranicaonline.org. Retrieved 2018-07-04. Pingree, David (2010). "BĪRŪNĪ, ABŪ RAYḤĀN vi. History and Chronology". www.iranicaonline.org. Retrieved 2018-07-04.
de Blois, François (2010). "BĪRŪNĪ, ABŪ RAYḤĀN vii. History of Religion". www.iranicaonline.org. Retrieved 2018-07-04. Lawrence, Bruce B. (1989). "BĪRŪNĪ, ABŪ RAYḤĀN viii. Indology". www.iranicaonline.org. Retrieved 2018-07-04. Abulfadl naba’I (1986), Calendar-making in the History, Astan Ghods Razavi Publishing Co.
Biruni, Abu al-Rayhan Muhammad ibn Ahmad al- (1910), E. Sachau, ed., Al-Beruni's India: an Account of the Religion, Philosophy, Literature, Geography, Chronology, Astronomy, Customs, Laws and Astrology of Indiae, London: Kegan Paul, Trench, Trubner & Co.
Wilczynski, Jan Z. (1959). "On the Presumed Darwinism of Alberuni Eight Hundred Years before Darwin". Isis. 50 (4): 459–466. JSTOR 226430. Wikimedia Commons has media related to Abu Rayhan al-Biruni. "BĪRŪNĪ, ABŪ RAYḤĀN – Index". www.iranicaonline.org. Retrieved 2018-07-07. "Al-Biruni (973–1048)." Encyclopedia of Occultism and Parapsychology. 2001. Encyclopedia.com. 5 Feb. 2015.